Champagne just makes everything better. Always. Some people have said to me that they just don’t like the stuff. But I think that if one hasn’t experienced good quality champagne, one would think all the stuff tastes the same. And that would certainly negatively affect one’s opinion about champagne in general. Well, this is most definitely good quality, vintage champagne made from 60% Pinot Noir and 40% Chardonnay. Disgorged in October 2012, we opened it at 10 years old in 2017. On this eyes, this treat is a golden tone with finely beaded and long-lasting mousse. The nose shows toast with citrus, yellow apple and hazelnut, while the palate is dry with high, juicy acidity and flavours of toasted french bread, almond, golden lemon meringue pie, and late autumn, grainy, yellow apple. Deeply complex and more than a little developed, this is WSET Very Good plus. I think Coco would have loved it. You can buy Nicholas Maillart grower champagnes at Marquis Wines. 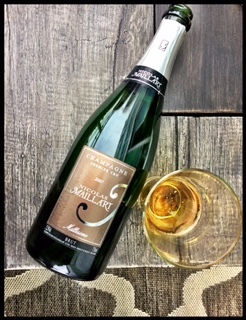 This entry was posted in Champagne, Chardonnay, France, Pinot Noir, RED, WHITE and tagged 2007, brut, bubbles, champagne, Champagne AC, chardonnay, france, Grower Champagne, Millesime, Nicolas Maillart, pinot noir, Premier Cru, Recolant Manipulant, RM, vintage. Bookmark the permalink. 4 Responses to Champagne, Brut, Nicolas Maillart, Premier Cru, Millésime, Champagne AC, France, 2007, 12.5% abv. Any day, for any occasion, Champagne is always the right choice. Thanks for the tips! Tis the season for champagne!!! This is the bottle we enjoyed in August at your place!